DESIGN A CUSTOM RAIN WATER HEAD. DESIGN A CUSTOM RAINWATER HEAD. Any shape can be used, Curved, Rectangular, or Tapered. Can also have a Rectangular or Circular Downpipe. Overflows can be Rectangular, or any number of circular overflows. There is also the option to reduce the downpipe size by introducing a 'funnel' section. Flow capacity is unlimited. The program will give crucial minimum dimensions. The final shape is limited only by your imagination within these dimensions. The diagram is indicative only, and will only show up to 3 circular overflows, but the program will work for any number. 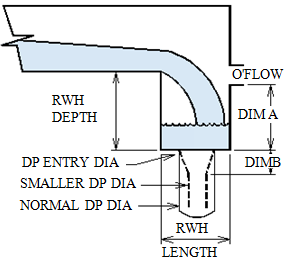 The water depth in the rain water head, and the total depth of the rainwater head is calculated from figure I3 in the Australian Plumbing Code. The total depth of the RWH is then modified if necessary to comply with note 1 Fig I2. Total RWH depth to be a minimum, of downpipe dia * 1.25 . The depth at this stage is dependent only on the entry orifice size of the down pipe. This is the water "head" required to force the necessary flow into the down pipe. The rain water head depth is then increased if necessary, to ensure that if the DP becomes completely blocked, all water will go out through the overflow spitter, and not raise the water level in the box gutter. The outlet spitter size is determined by the weir formula for a rectangular spitter, or the orifice formula for a circular overflow spitter. This size agrees with the code where applicable. For example, a rectangular spitter size agrees the side outlet size of an internal box gutter sump, and the circular outlet size agrees with FigI3 (which is the orifice formula). The outlet is sized to take the full flow, assuming a completely blocked down pipe. The outlet is positioned so that it will not discharge during the design flow, and will not cause the water level to rise in the box gutter during full overflow conditions. To accomplish this, the outlet spitter height is checked against the rainwater head depth to see if it will fit using the above parameters. If it won't fit, the rain water head depth is increased until the normal 'design' operating water level is at least 50mm below the bottom of the spitter. If the rain water head depth is increased in this way, the rain water head length is also increased to accommodate the water trajectory from the box gutter. This also means that if a 'smaller' spitter is used, it will require more 'head' above it to force the water through the smaller opening. So to prevent the water level from rising in the box gutter, the spitter must be lower. Which means that the RWH may have to be deeper. Making the rain water head deeper will also make it longer to accommodate the water trajectory. If using the 'smaller down pipe' option, the length of the conical section is calculated using the Bernoulli theorem (as in a venturi meter) with the coefficient of discharge = 0.95. This assumes a full pipe through this section. The suggestions are not mandatory, and are supplied only to give the user an average starting point for further manipulation up or down. The 'normal' down pipe dia is the size that requires approximately the shallowest RWH in accordance with the Code. Then rounded to the nearest available downpipe size. Similarly for a rectangular down pipe. If only one circular overflow, the circular overflow size is the down pipe diameter, as the flow from the spitter must be able to handle the same flow as the down pipe. Where there is more than one overflow, the design flow is divided equally, and the spitter size shown will also be the suggested DP size for this fraction of the flow. The rectangular overflow width is equal to the box gutter width less 100mm. (50mm clearance on both sides). The overflows are best on the front face of the rain water head so as to project water as far from the building as possible. However they may be positioned on the side of the RWH provided the rain water head is at least 100mm wider than the box gutter on the side of the overflow. This is so the water trajectory will not flow out of the side overflows during normal operation. As it is very unusual for the spitters to be on the side face of the rain water head, the program only checks if the spitters will fit on the front face. If they won't fit, the width of the rain water head is increased until they do. This is done by allowing only a 20mm clearance between the spitters, and from the sides of the rain water head. Similarly if the downpipe will not fit, the rainwater head length is increased until it does. By allowing only a 10mm clearance on each side. If this case occurs, the program will advise the user that the sizes have been increased to accommodate the spitters or the downpipe. The user can then choose to adjust the clearances, change the spitter or down pipe sizes, put some spitters on the side face, or accept the results. The width or length of the rainwater head can be increased to any size. But cannot be reduced to less than the sizes given in the program. If you want a curved rain water head, please ensure that no overflow ends up in the water trajectory from the box gutter. This means that overflows in the path of the trajectory should not be any closer to the box gutter than the calculated length of the RWH. If using the smaller down pipe option, it may not be applicable to continue this size in any horizontal pipework. As this option may force more flow into the 'inground' section of the pipework than is allowable. Inground pipework has a maximum allowable velocity of 2m/sec under the plumbing Code. Also water may back up into the down pipe. So the inground pipework size should be checked. This can be done here. If the rain water head looks ridiculously deep, try increasing the size or number of overflows. Remember small overflow sizes create a restriction, and cause the water level to build up in the rain water head. To prevent it building up in the box gutter as well, the rain water head must be deeper. And again, being deeper also means longer. Sometimes another way of reducing the rain water head depth, is increasing the throat diameter of the down pipe, ie try a larger normal down pipe. A wider box gutter reduces the rainwater head length, as the velocity of discharge is slower, thereby reducing the water trajectory. However a wider box gutter will also increase the rainwater head depth slightly. A wider box gutter does not flow as deeply as a narrower one.. Therefore there is less room for the water level to build up in the rainwater head before it starts to affect the water level in the box gutter. So the rain water head depth is increased to accommodate this. It is not necessary to enter anything in the 'number of circular overflow' boxes as the program will default to 1. Also it is not necessary to enter anything in the 'smaller downpipe' box, as the program will assume no reduction in down pipe size. When using more than one circular overflow in the main suggestions, the program chooses to increase the width of the rain water head to accommodate this if necessary. The alternatives are to try a smaller overflow size and increase the depth and length of the rain water head. It is left to the user to try all the various combinations in the 'Your Turn' section. The Rainwater head picture does not depict any more than 3 overflows, and will usually default to the last picture shown. However the answers still relate to the number of overflows entered. If draining to a rainwater head at the end of a box gutter use this calculator. or incorporating vertical faces use this. The graphs in the Code were confirmed by experimentation only up to a flow of 16 litres/sec, and for this reason the graphs do not go beyond this flow. However this calculator is based on standard hydraulic formulas, weir, (broad crested being the worst case, which allows for a spitter), orifice, trajectories, and Bernoulli, with parameters adjusted to give results consistent with the Code. Hence it will work for any flow. If you find that the programs save you time or money, or agro, please feel free to help me crack a stubbie or two.